Sometimes we hear songs that we could have sworn we heard before. Like old friends, we hear them and right away feel at ease. Start grooving around a little bit. Might sing the chorus the second time it comes around. Those songs. This is that song. This jamandahalf is a funky combination of an old body with a new heart, a song that is so soulful you're sure it must have been made in a groovier era, yet so current that it somehow fits today's world perfectly. 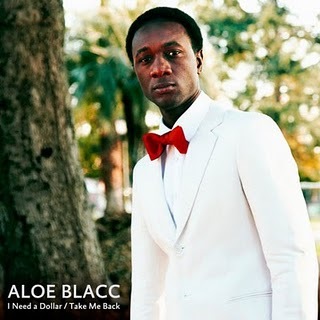 Aloe Blacc, an artist from just round the ways in LA, has been around for a couple years, starting off as a rapper with DJ Exile, then joining a band, and recently returning to make it as a solo artist. But I'm guessing myself and most people first heard this jam as the intro to HBO's new decently entertaining Entourage copy, How to Make it in America, about two buddies trying to make it in New York. Although the episodes have been largely hit or miss, the intro, featuring this jamandahalf, is the closest thing in TV to a plate of ribs at Red Hill BBQ; it never fails to impress. Although dripping with a soul not seen in years, Blacc's lyrics reflect these turbulent times. Blacc sings about a man tough on his luck, laid off, and broke, with his only two friends being "whiskey and wine." All he's looking for is a little love, someone to help him, but if you can't do that, a dollar will do. The elegant simplicity of "I Need A Dollar" shines throughout the song. Although trumpets join in towards the end, I wouldn't blame ya if you missed them, entranced by Blacc's effortless crooning. For that dollar, Blacc has a story to tell. And it's tough to say which is more important, a story or a dollar (probably depends on how hungry you are); all I know is that at the end of the day I hope I have a couple more stories than dollars. But, if troubles come my way and I need a dollar, hope you're ready to hear a story.